Tonsillitis occurs when the tonsils get infected. The infection could be because of bacteria or virus. Onion has strong antibacterial and anti-inflammation properties. 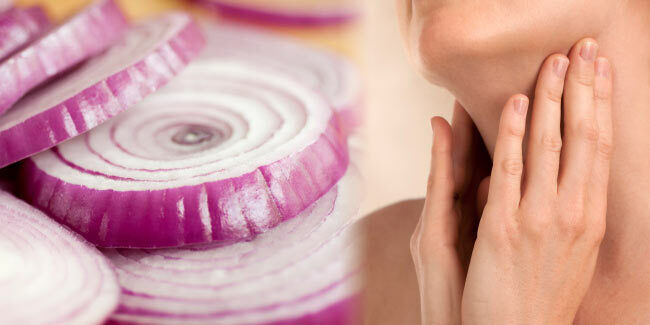 Gargle with onion mixture for 7-8 days to cure tonsillitis. Tonsillitis is a condition where the tonsils, located inside the throat, become inflamed due to bacterial or viral infection. The tonsils are masses of tissues meant to prevent bacteria and virus from entering the airways and lungs, thus reducing risk of an internal infection. The tonsils tap almost all the germs on them and fight them off by producing antibodies. However, sometimes the tonsils themselves get infected leading to discomfort and pain in swallowing. Tonsillitis usually goes away on its own after 3-4 days. There are several over the counter tonsillitis cure available however if you are wondering how to get rid of tonsillitis fast you can consider onion to treat tonsils. But first let’s understand tonsillitis better. Tonsillitis is a common condition, especially in children, and can occur frequently. The most common causes of the condition include infection from Streptococcus bacteria, influenza virus, adenoviruses, herpes simplex virus, parainfluenza virus, Epstein-Barr virus and enteroviruses. The most common and significant symptoms of tonsillitis is the inflammation and swelling of the tonsils. Other common symptoms include, throat pain, headache, loss of appetite, ear pain, difficulty swallowing or breathing through mouth and ulcers on the throat. Now you know almost everything about the condition let’s move on to the treatment. If you want to try something at home to treat tonsillitis, you can make use of onions juice for tonsils. Onions are packed with antibacterial and anti-inflammatory properties that can work wonders against tonsillitis. All you need is a large onion and a cup of warm water. Extract fresh juice out of the onion with the help of a juicer. Add the juice to the cup of warm water. Now gargle with the mixture at least 3-4 times a day for the next 10 days. It will help with the symptoms as well as reduce the inflammation and infection. It is worth reminding that even though the symptoms may start disappearing in the next 3-4 days, you need to use antibiotic treatment for atleast 8-10 days to effectively cure tonsillitis. It is recommended to visit your doctor as soon as you experience tonsillitis symptoms. The doctor will perform a throat swab culture and a strep test by gently swabbing the back of throat to detect bacterial infection. It is not possible to detect viral infection with these tests, but absence of bacterial infection is usually considered to be a case of viral infection. Once infection is detected, the doctor can prescribe some antibiotics to cure the infection.